Ruth Bloch's stellar essays on the origins of Anglo-American conceptions of gender and morality are brought together in this valuable book, which collects six of her most influential pieces in one place for the first time and includes two new essays. The volume illuminates the overarching theme of her work by addressing a basic historical question: Why did the attitudes toward gender and family relations that we now consider traditional values emerge when they did? 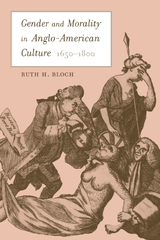 Bloch looks deeply into eighteenth-century culture to answer this question, highlighting long-term developments in religion, intellectual history, law, and literature, showing that the eighteenth century was a time of profound transformation for women's roles as wives and mothers, for ideas about sexuality, and for notions of female moral authority. She engages topics from British moral philosophy to colonial laws regarding courtship, and from the popularity of the sentimental novel to the psychology of religious revivalism. Lucid, provocative, and wide-ranging, these eight essays bring a revisionist challenge to both women's studies and cultural studies as they ask us to reconsider the origins of the system of gender relations that has dominated American culture for two hundred years. Ruth H. Bloch is Professor in the Department of History and former Chair of Women's Studies at the University of California, Los Angeles, and prize-winning author of Visionary Republic: Millennial Themes in American Thought, 1756-1800 (1985).